Ever been to a land that made you scream “So magical!” at each turn of the road? 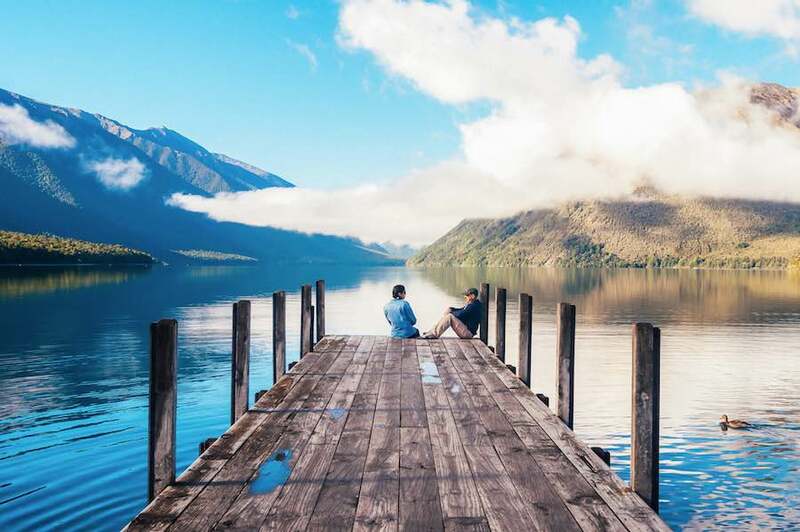 If yes, you’ve clearly been to New Zealand, else book your tickets, grab some cash and read this wonderful list of absolute best things to do in New Zealand! 1. Jumping from the Kawarau Gorge Suspension Bridge! The Kawarau Gorge Suspension Bridge in New Zealand is the world’s first ever Bungee Jumping site and to this day remains one of the most popular jump sites across the world. 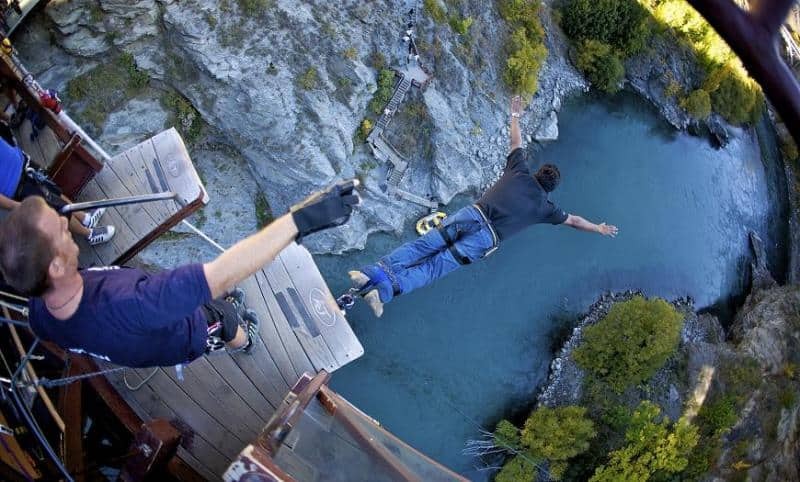 Get your adrenalin rush by visiting this scenic jumping spot where one can view the Kawarau Gorge in all it’s splendour and beauty! 2. Fly in the blue skies atop Queensland! 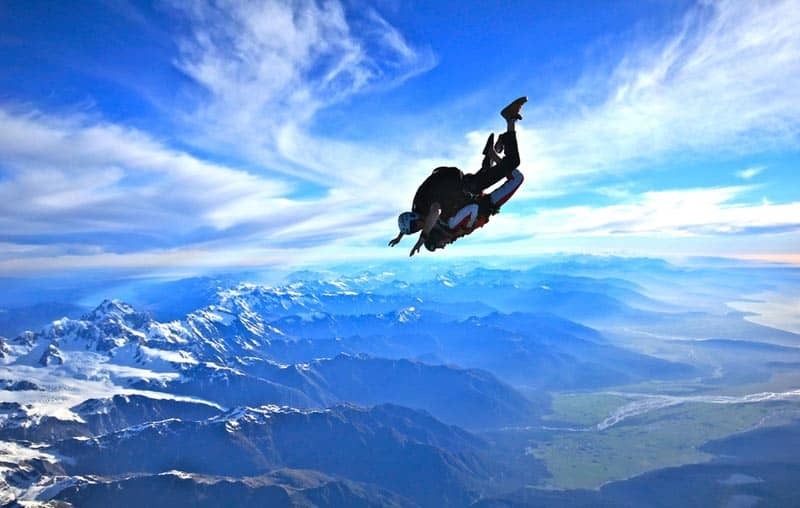 Queenstown in New Zealand offers one of the best spots in the world for an awesome skydiving experience. Soak in the magnificent setting of the surrounding snow capped mountains and broaden your horizons with the view from the skies! 3. Battle the fast flowing Shotover ! Imagine sitting in a rubber dinghy paddling furiously to stop yourself from being flipped over into the fast flowing river! It’s super fun and this is exactly what you get in the Shotover river. 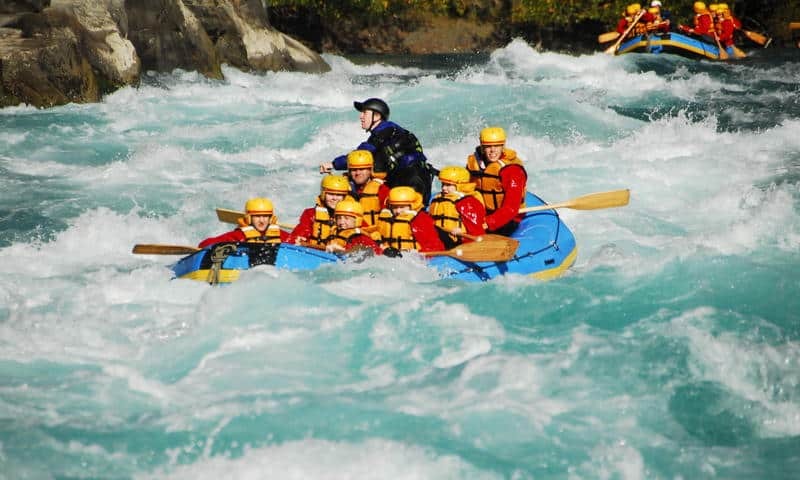 Running for 60km through Otago, the Shotover is narrow, fast flowing river with turquoise blue waters making it a super popular whitewater destination for you! 4. LOTR hiking through magical New Zealand! 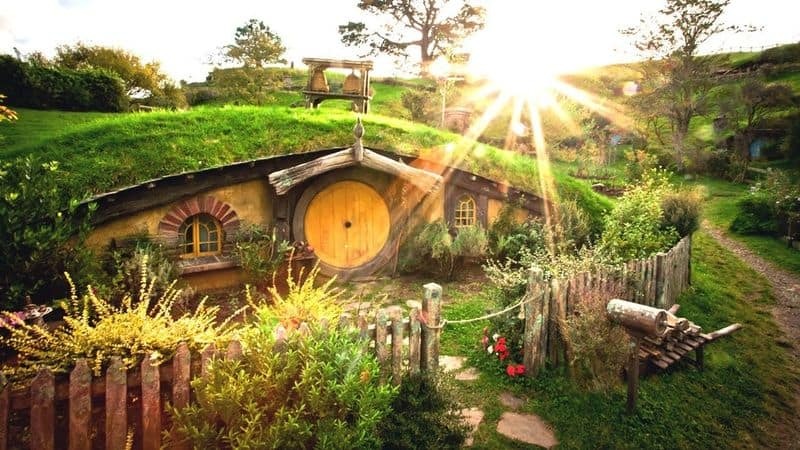 The Lord Of The Rings was the movie that put this enchanting and beautiful land on the map of travellers worldwide. True to the nature of the movie, New Zealand also comes across as a magical country that is best appreciated by hiking on foot across its breathtaking landscapes. Experience in person the natural attractions that await you. Also, be sure to visit Hobbiton! 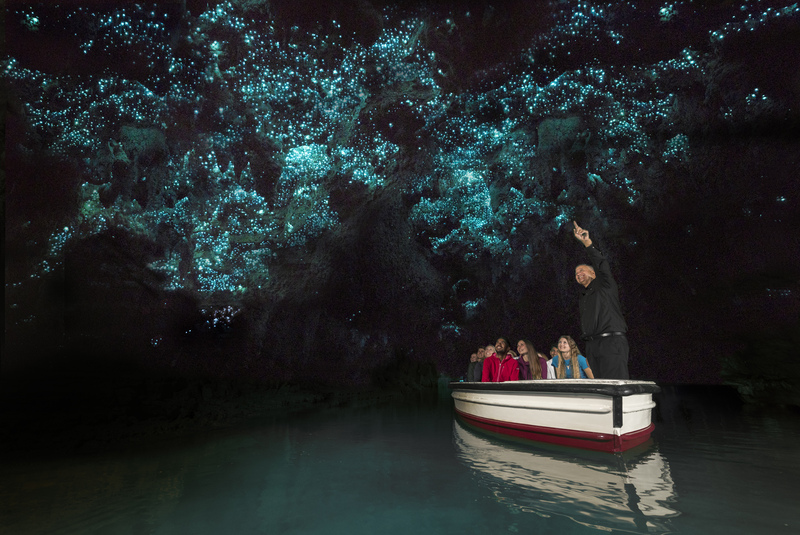 Float on rafts or row down the river below the Waitomo Caves to capture the magical glow of the glowworm carpeted ceiling. Just let yourself float, flow along with the river and in that profound quietude save for the gurgling of the waters, marvel at mother nature’s light display. New Zealand’s smallest national park is a destination that makes people go “wowww! 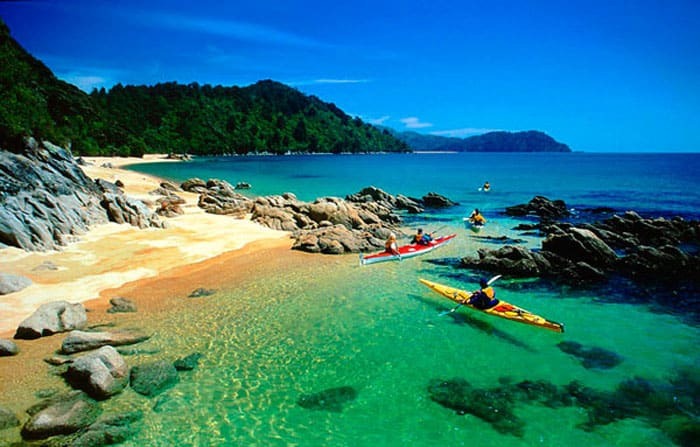 Closed to vehicles, Abel Tasman is a hiker’s dream that one must enter by boat, foot or a small plane. Kayaking is a popular activity offered here to traverse the national park through its various inlets and also by circumventing along the coast. Catch blue penguins, oystercatchers, wood pigeons and other rare birds in action. Marlborough sounds is full of beautiful scenery and incredible wildlife. The best way to experience this is by spending a few days there sailing, hiking or just relaxing on a lakeside holiday home. For those who like fishing, Marlborough is a good fishing spot, or if you like diving, the Mikhail Lermontov shipwreck is is a popular diving spot. Dine on locally grown produce at one of the area’s “slow food” restaurants and don’t leave without sampling the vintage wine of the region, Sauvignon Blanc, famous the world over! 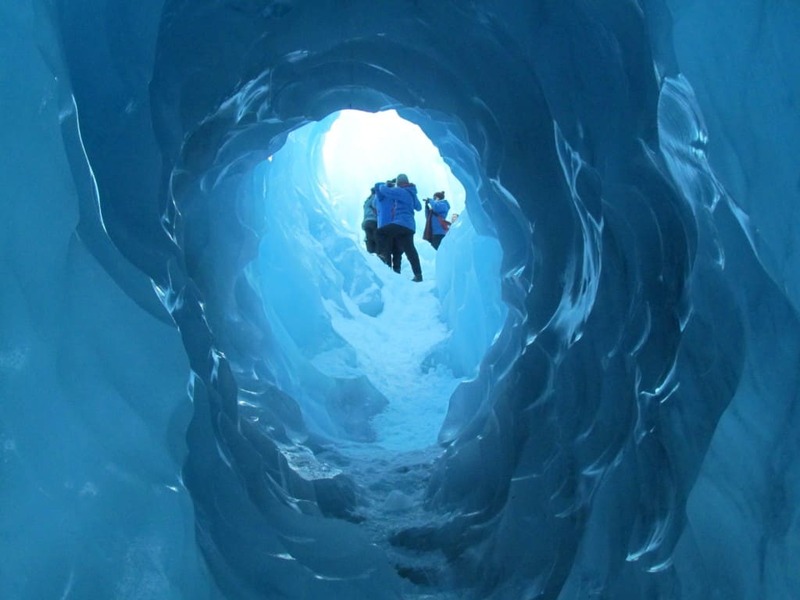 The Fox Glacier in New Zealand is home to a spectacular glacier cave system that is a stunning iridescent blue in colour. It’s one of the longest glaciers in in New Zealand with a 13 km fall from southern alps down to the coast. Guided trekking activity is offered by tour operators to this raw natural beauty. The Bay of Islands has the perfect combination of local Maori Culture, beautiful beaches and adorable small towns, making this region one of the country’s most popular tourist destinations. 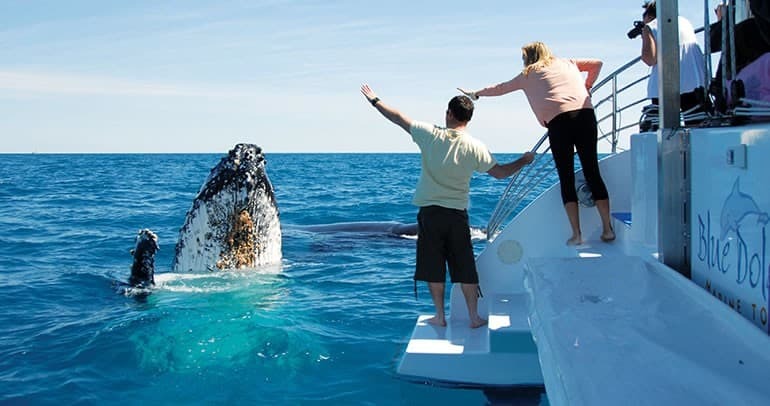 Go on a day cruise, yacht or kayak and there’s a good chance you will encounter Giant Sperm Whales, pods of Dusky dolphins, Wandering Albatross and New Zealand fur seals. Depending on the season, you may be able to spot migrating Pilot Whales, Humpback Whales and even the big daddy of them all, the Blue Whales! 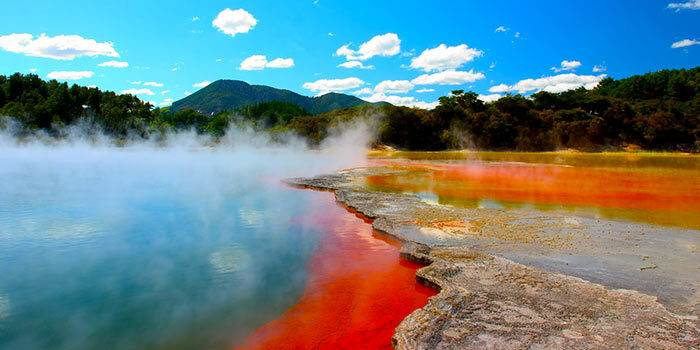 Rotorua is known as the thermal wonderland of New Zealand. With explosive geysers and natural hot springs, it literally qualifies as New Zealand’s coolest “hotspot.” Take a dip in a hot spring or a soothing soak in a volcanic mud pool. Experience the authentic Maori culture at Rotorua. The Maori Haka, the traditional war cry-dance, is a hair raising ceremonial dance that travellers going to New Zealand must not miss! Tell us in the comments below what you think about our list. Now you can travel to New Zealand, enjoying the best currency exchange and Forex Travel card rates on New Zealand Dollar. Put your Rupee to good use and get the best exchange rate for New Zealand dollar anywhere in India at ExTravelMoney.com! « Get Passport Issued Fast In Just 1 Week: India’s New Passport Rules!